March 3, 2014 bcalvanocoachingLeave a Comment on Weekly Angel Oracle Card Reading for March 3 through 9. Weekly Angel Oracle Card Reading for March 3 through 9. 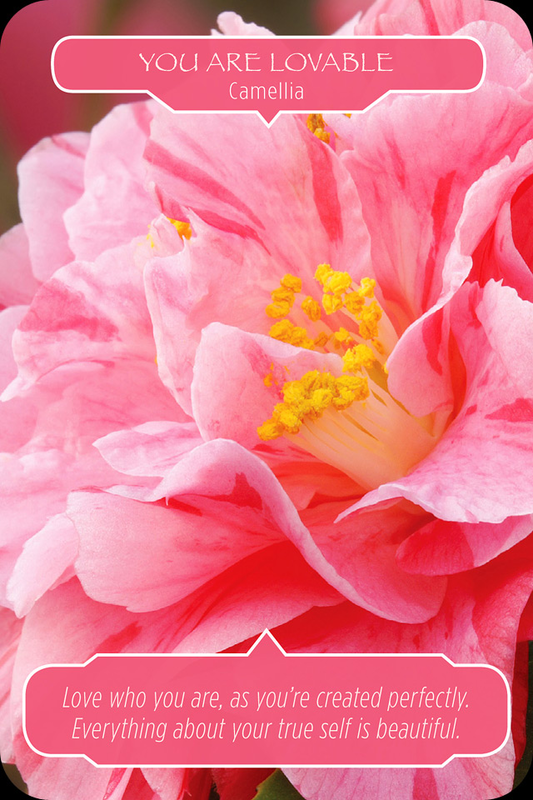 For Monday and Tueday : YOU ARE LOVABLE: CAMELLIA: Love who you are, as you’re created perfectly . Everything about your true self is beautiful. Embrace love! This message is about being your real self, your authentic self and knowing that you are great! If you have been hiding who you really are, keeping your true emotions from yourself and others, keeping from sharing your true talents to the world or holding back on sharing your true dreams to yourself and the world, this week it’s time to let it go. You are perfect in the eyes of God and the universe. Your harsh judgements of yourself have not helped you. It’s time to open your heart and also to stop hiding. Especially if your life is not perfect (which nobody’s is by the way) or you are feeling down and out, you can regain your peace by telling the truth and knowing you are not alone with your humanity. You are lovable just the way you. We are all on a journey, in a process of spiritual development. If you are wanting a relationship you can use Camellia to assist you in finding that special one. Write down your core values that you believe in and the qualities that you are seeking in a relationship. You can also write this on a photograph of a Camellia or wrap the note around a crystal and place it under your pillow. Either method releases the energy to the universe so that the angels can deliver a perfect match. 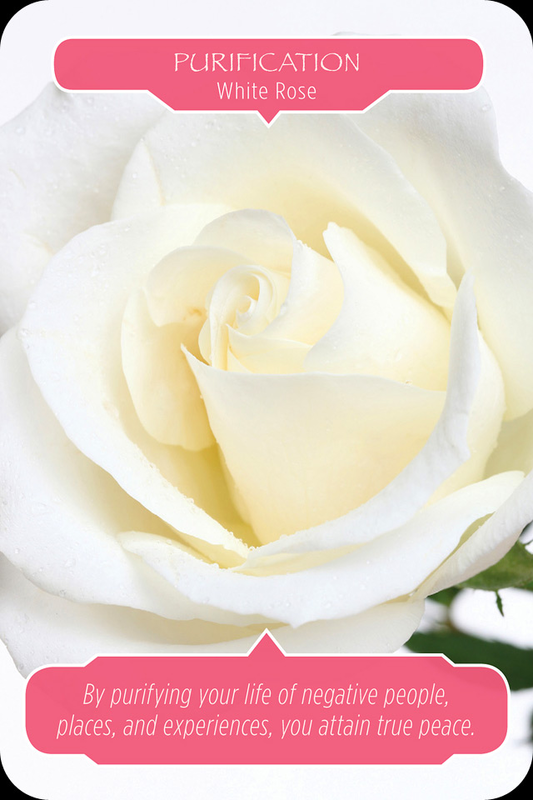 For Wednesday and Thursday we have the card, PURIFICATION: WHITE ROSE: By purifying your life of negative people, places and experiences, you attain true peace. This card follows the previous. We all can use more peace and even the attainment of peacefulness is totally possible. By being rigorously honest with ourselves it may be time to let go of energies that no longer serve us. It’s time for an early spring cleaning and releasing people and activities that are not in alignment with our higher purpose. If you are feeling exhausted and stressed out you may need to take the time to renew and also to examine the energy that comes from interacting with particular people and being in certain places. Your peace will come out of the choices you make. The gift of serenity can only be given to you by you. You may also wish to de clutter your physical space to allow for the new energy of spring. Your peace starts with you. 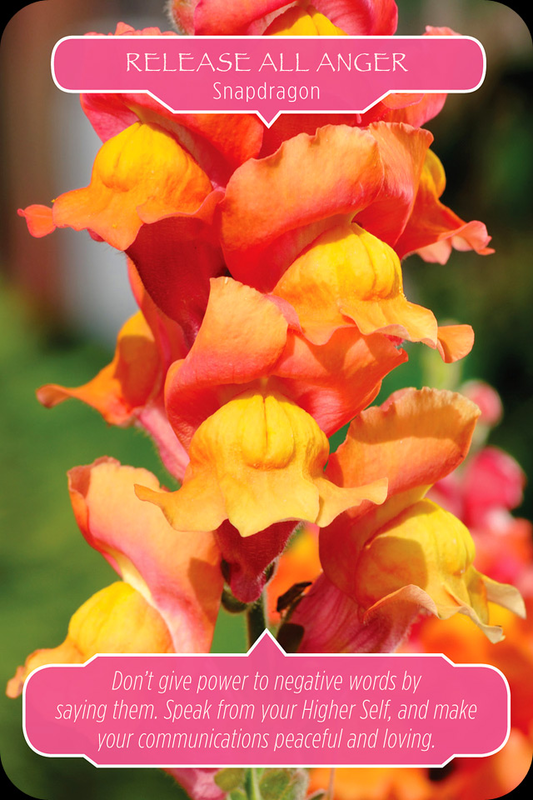 For Friday, Saturday and Sunday we have the card, RELEASE ALL ANGER: Snapdragon: Don’t give power to negative words by saying them. Speak from your Higher Self, and make your communications peaceful and loving. Again this message continues with the previous guidance to go within this week and see what needs to be addressed and released. We all have anger. Some of us are a little more practiced on acknowledging it and then letting it go. If you are having feelings of being stuck, blocked, irritated or even depressed you may be suppressing anger. This is energy. If unreleased it can accumulate and create illness and even more anger. This message also addresses our commuciations. Communicating your thoughts to the angels or a caring listener can be healing. Complaining about your anger to others usually gets others to share their anger with you and the end result is you have added confirmation and more angry energy to your already charged situation. It doesn’t really help! We are being asked to choose our thoughts and words carefully as they attract energy. Ask the angels to help you release any lower emotions. You may also want to see who you need to forgive and take the action of mentally doing so. Process lower emotions in safe ways- don’t add to them. This week we are receiving guidance to go within and check with ourselves with what’s really going on. If we have being judgemental and critical we are guided to be more loving with ourselves. We are also guided to purify our thoughts and even our relationships and surroundingl Be attentive to how we are using words and thoughts as they can make a huge difference on how we are manifesting what we want in our lives. The power and magic are in our hands. Listen to a guided meditation I did on my show Saturday March 1, releasing lower emotions with Archangel Michael. Have a wonderful week! God and the angels have your back! I will give Goddess guidance oracle card readings. We will call upon the energies of Isis, Mother Mary, Brigit and Kuan Yin to see what guidance they have for us. We will learn how to work with these goddess energies in our daily lives. I am available for personal in depth readings, speaking events, angel parties, classes, workshops and mini angel card reading events! Previous Saturday March 1 4pm EST LIVE show on Blog Talk Radio!! !